The autonomy of municipalities is rooted in the human rights chapter of the Icelandic constitution. This legal article protects the citizens’ right to exercise control over issues that concern them. Thus, it secures the existence of Icelandic municipalities, as this fundamental status must be considered in decisions on whether and how existing structures should be changed. It has an enormous influence on the development of Icelandic municipalities. Two systematic attempts at reform have been made in recent times, in 1993 and 2005. 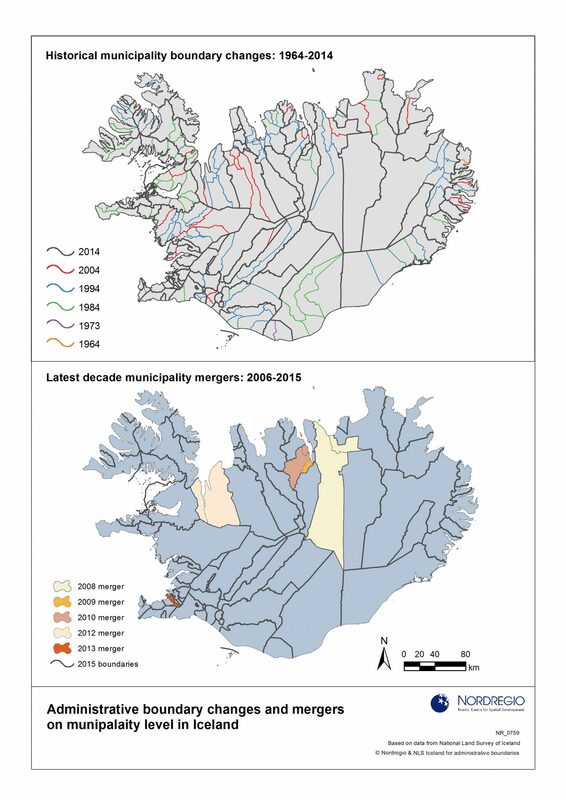 The government and the Association of Local Authorities in Iceland have pushed for mergers of municipalities; it is argued that larger municipalities would have greater administrative capacity. During these two reform processes, the municipalities were given a new area of responsibility: elementary schools in 1996 and the care for disabled in 2011. Residents voted on a potential municipal merger in both 1993 and 2005, and as a result, the number of municipalities was halved over 12 years. Despite this significant decrease in numbers, there has been no significant change in the relative scale of municipalities. That assessment is supported by the fact that many of them have very small populations: 26 municipalities have fewer than 500 residents each, whereas 93% of the population live in 33 municipalities that have more than 1000 residents each. When the mergers were evaluated in 2010, it was concluded that it would not be sensible for the government to push for further mergers of municipalities as it had in 1993 and 2005. Another interesting finding was that all representatives from municipalities that had been involved in the reform praised the project and concluded that their municipalities were stronger than before. Especially positive results were found in relation to efficient management, better service and stronger finances. The evaluation report suggests four ways of making the municipal level more efficient. One way is to enforce a minimum population. The second way is to create service regions by moving services from the national level to the municipalities, which can manage the service area in co-operation without having to merge. The third way is to focus on the development of service areas and call for government regulation of size and boundaries. The fourth way is for municipalities to co-operate in both traditional and new ways without governmental interference. Some of these suggestions have been adopted in recent decades as the municipalities have taken on new tasks; the municipalities are now fewer and generally larger, and their administrative demands have intensified. Financial success has progressed from words into reality. In recent years, the discussion about transferring tasks from the government to the municipalities has involved more layers of administration, and the idea of interregional municipal co-operation in particular has been on the agenda. This idea is aimed at strengthening the municipal level through increased decentralization without the need to merge municipalities, trusting that it will be beneficial for the residents and the private sector. The goal could well be reached with increased co-operation between municipalities and regions rather than by further mergers of municipalities. The next major task is the planned transfer of elderly care, and the transfer of the entire health-care sector has been discussed. There is great willingness for and interest in further co-operation and transfers of tasks that were formerly the government’s responsibility. One example are the contracts between regional actors and the government to organise public transportation in their areas. The Minister of the Interior has proposed that a working group would be appointed during the fall 2015 to further strengthen the municipality level. The proposal suggests that the working group would come up with an action plan for the next 10 – 12 years. The objectives in the plan include ways to improve cooperation, decentralization, resident involvement and quality and diversity in public services. The plan also includes a new legal framework on public finances, as well as the development of information technology to provide new tools and opportunities for public administration. The preparations are well on the way and the appointment of a working group is likely to happen in the fall 2015. A new wave of reforms sweeping over the Nordic countries?